We believe that one of the biggest responsibilities entrusted to us as a manufacturer is to produce our baby carriers in a fair and ethical way. We want to share with you how we feel about this, and so we highlight our commitment to responsible practices in everything we do. 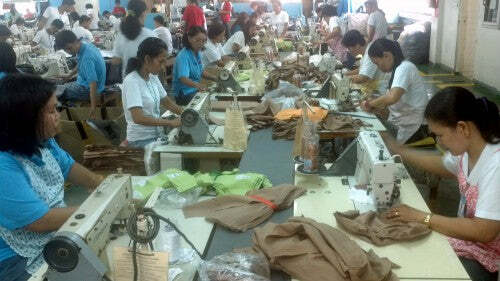 The facility that produces Onya Baby carriers came highly recommended and produces a number of well-known, high-quality lines of goods. But even though its reputation is top-notch, we thought it incredibly important to see the factory in person; to talk with the people there, to ensure the treatment and quality are up to the highest standard. Billy, who is one-third of the Onya Baby family and Head of Operations, has been to the factory six times and has developed a friendship with the management of the facility and many of the sewers who work on Onya Baby carriers. Just to give you an idea of the attention given to the level of quality in manufacturing, the people who work on the different parts of each Onya Baby carrier have become experts in the construction of that particular part. Those who sewed the first run of carriers will be the same people who sew the same parts on subsequent runs. They know what they’re doing, which ensures that each part will be done well, each time, by the same person. We think it’s pretty cool that the people sewing the carrier you’ll wear with your baby have practiced their part and know what they’re doing. Onya Baby is pleased to have partnered with a manufacturer in the Vietnam who respects and values their employees. To us, it’s extremely important to employ a facility that is run in a way that meets our high standards for overall quality. Operating with a collective bargaining agreement between its employees and management, third-party auditors ensure fair labor practices are strictly adhered to. Workers are well treated in respect to wages, working environment, hours worked, benefits and many other areas. Additionally, Vietnam law sets the minimum worker age at 18, so you can rest assured no children have been employed in the construction of your Onya Baby carrier. Our manufacturer is highly committed to continually assessing and updating the way they operate, guaranteeing the safest and most efficient operations and highest quality products are produced. ISO 9001-2008 certified, (an internationally recognized and standardized process for guaranteeing a complete quality management system), their promise is to provide complete transparency through the entire manufacturing process. We have one goal at Onya Baby, and that is to provide the best products at reasonable prices while ensuring we do not contribute in any way to the mistreatment of the people producing our carriers. We have done our best to offer you a product that you can enjoy with confidence in the knowledge that it was produced fairly. Do you have any questions or comments about our production philosophy? Please post your comment or question below.